SUBSCRIBE TODAY AND JOIN OVER 150,000+ FOLLOWERS AND RECEIVE A FREE E-BOOK! This post may include affiliate links. Please see our Disclosure Page for details. Looking for other delicious Instant Pot Soups? Winter is almost here and I can’t believe it. My family loves homecooked meals, especially during the Winter months. Ya’ll know I’m crazy about my Instant Pot. My Instant Pot Beef Stew Recipe is amazing. 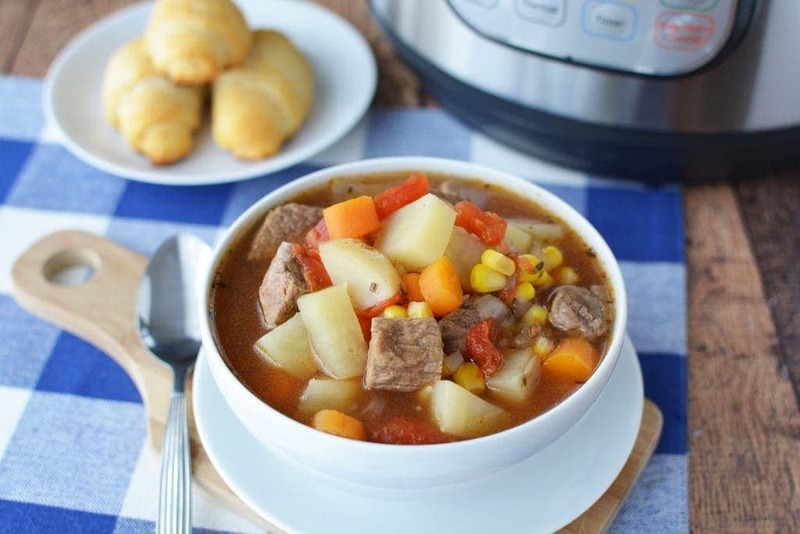 This Instant Pot Beef Stew Recipe uses basic ingredients like beef, potatoes, carrots, and more – This Instant Pot Beef Stew is a classic winter recipe perfect for those cold days. The advantages of using the Instant Pot for this recipe is that it’s quick. It’s also budget-friendly, which is important. I know many of my readers have big families to feed, so this recipe will help you stretch your dollar. Not to mention, it’s a meat and potatoes kind of recipe, you just can’t go wrong with it. Let me know if you decide to try it and what you think. 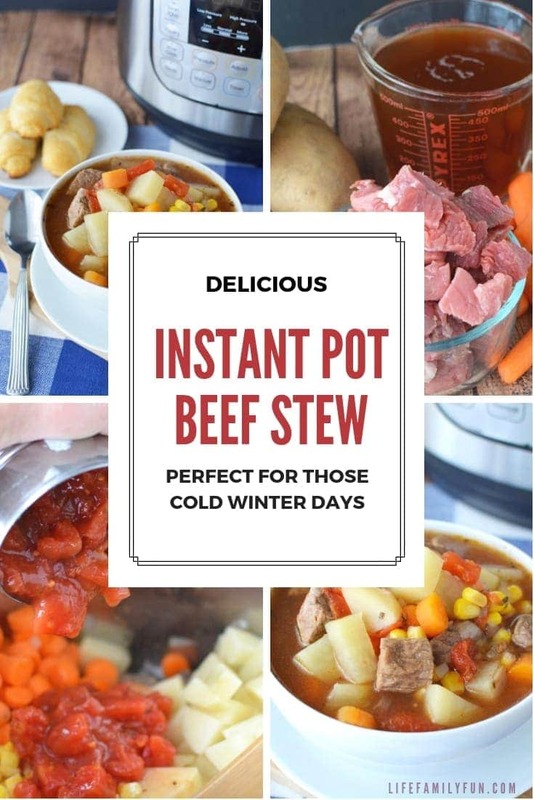 The Instant Pot Beef Stew recipe is definitely a favorite of mine. Start by placing the beef and onion into the instant pot and turn on to sautee. Sautee until beef is brown and onions are translucent. Add corn, carrots, potatoes and tomatoes to instant pot. Stir in beef broth, water and spices. Season with salt and pepper. Place the lid on the instant pot and seal the pressure release. Turn the pressure cooker on Manual, High pressure, for 5 minutes. When instant pot is finished, quickly release pressure and open the pot. Serve with rolls or biscuits if desired. 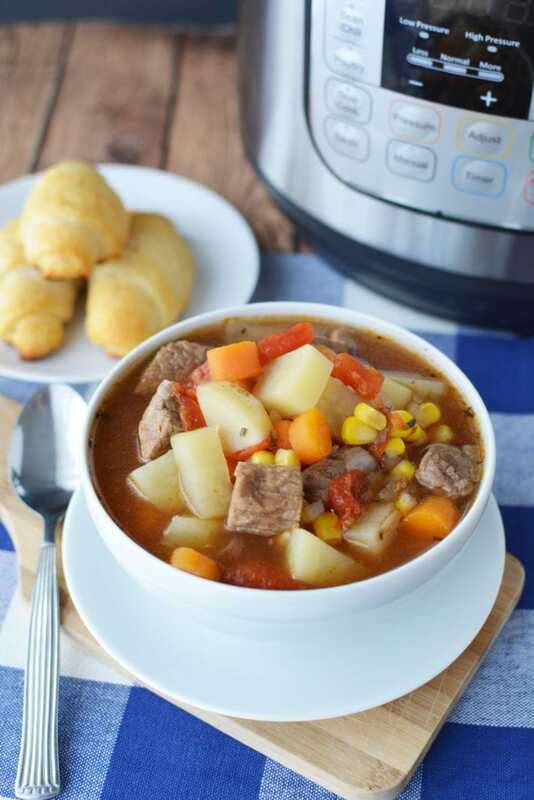 This Instant Pot Beef Stew Recipe uses basic ingredients like beef, potatoes, carrots, and more – This Instant Pot Beef Stew is a classic winter recipe perfect for those cold days. Place beef and onion into the instant pot and turn on to sautee. Sautee until beef is brown and onions are translucent. Add corn, carrots, potatoes and tomatoes to instant pot. Stir in beef broth, water and spices. Season with salt and pepper. It’s easy to fall in love with this golden veggie thanks to this Instant Pot Butternut Squash Soup. This butternut squash soup is the perfect Fall Soup Recipe for lunch or dinner or to add to your Thanksgiving meal. You need to make my famous Instant Pot Chicken & Dumplings. This is one meal your family will love from start to finish. I’m trying out new recipes with the Instant Pot. It’s sort of like trying to learn to drive a car all over again, but much easier the second time around. Cooking goes much faster, I love it. 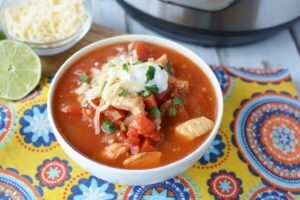 One of my new favorites is the Instant Pot Chicken Taco Soup. And seriously, it’s so darn easy and delicious. Oh, how times have changed…back in the day. It would take a good portion of the day to cook and make Chicken Taco soup that was hearty with the perfect blend of all the flavors coming together. Now? This recipe literally only takes 10 minutes. Winona Rogers is the author of Life Family & Fun a national blog focusing on parenting, easy recipes, Home & DIY, Lifestyle, Family Fun and Travel. Her site was nominated as the Top 10 Parenting Blogs in Atlanta, Top Disney Blog, Family Travel Expert and has been featured in media on 11Alive Atlanta & Company. In her spare time, she loves to travel with her family and cook. Winona and her husband have four children and five grandchildren living in Atlanta, Georgia. perhaps you could state in the recipe for the beef stew the can tomatoes is it a l5 oz or 28 oz.. and also browning Thanks. Life Family Fun is a resource for favorite family & luxury travel destinations, active lifestyle, Disney, Entertainment, Home and DIY, parenting teens and tweens, family recipes, and technology favorites. We have four children living in Atlanta, Georgia. For collaboration, please email [email protected] Read more. Join over 150, 000+ LifeFamilyFun.com community members today. LifeFamilyFun.com makes no claims of expert status and the owner will not be liable for any losses, injuries, or damages from the use of the information found on this website. LifeFamilyFun.com is a participant in the Amazon Services LLC Associates Program, an affiliate advertising program designed to provide a means for sites to earn advertising fees by advertising and linking to amazon.com.